Paperback, 6.5 x 9.5 in. / 192 pgs / 150 color. Edited with text by Angeli Sachs. Text by Claudia Banz, Michael Krohn. Architects and designers have always played a vital role in shaping society. 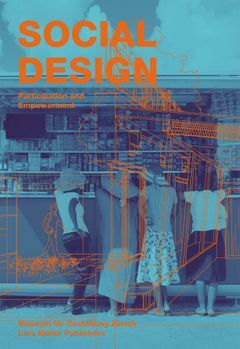 Social Design presents a long-overdue survey of current international activity in this realm, from new infrastructures and the reclaiming of cities by their inhabitants as seen in the work of Assemble and Gehl Architects to build-it-yourself housing by Urban Think Tank, all the way to GRAFT's solar kiosk, an energy source that is driving sustainable development opportunities for communities. The book addresses this enormous topic in six chapters: Urban Space and Landscape (including works by Antonio Scarponi and Organization for Permanent Modernity); Living, Education, Work (including Francis Kéré and Urban Think Tank); Migration (including Shigeru Ban, the Refugee Nation); Production (including Andreas Möller); Networks (including One Laptop per Child, GRAFT); and Environment (including Olafur Eliasson, Frederik Ottesen and Philips Design). Some 27 projects in the areas of cityscape and countryside, housing, education and work, production, migration, networks and the environment are framed by three research studies that trace the historical roots and foundations of social design and look at today's theoretical discourse as well as future trends. FORMAT: Pbk, 6.5 x 9.5 in. / 192 pgs / 150 color. Published by Lars Müller Publishers/Museum für Gestaltung Zürich.